Before the start of the Texas hold'em poker boom a couple of years ago, seven-card stud was one of the most popular poker variations in the United States. The game can be played with two to eight players, and the biggest difference between seven-card stud and Texas hold'em or Omaha is that seven-card stud does not involved a flop, and in most cases, it doesn't involve community cards at all. As you can see in the image above, to begin each hand a player is dealt the first two cards face down and then a third facing up. This is often called third street. The two face-down cards are called the "hole cards" and the face-up card is called the "door card." Based on these three cards, one would decide whether or not to continue with the hand. 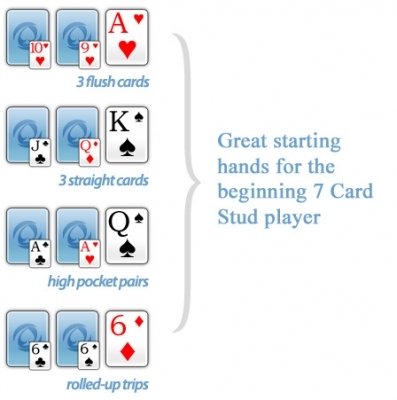 Like in any poker variation, starting-hand selection is extremely important in seven-card stud. Each player gets dealt a total of seven cards, of which three are dealt face down and four are dealt face up. From these seven cards the player has to choose his best five-card combination. The hand rankings are identical to those in Texas hold'em or Omaha; a royal flush is the best possible hand and the worst hand is the high card hand (no pair). While the blinds are the forced bets in Texas hold'em and Omaha poker, antes are the forced bets placed by every player before receiving any cards. As an example, let's think of a $10/$20 seven-card stud game with an ante of $1 and a bring-in of $5. Each player wanting to be dealt in to receive a hand would have to post the $1 ante, creating a pot worth competing for. The first three cards are then dealt to each player before it is determined that one player must post the bring-in. In seven-card stud, the player with the lowest-ranking door card would have to post the $5 bring-in at minimum, but this person does have the option to "complete" the bet by posting $10 (the small limit of the game). From there, the betting continues clockwise around the table, with each player having the option to call, raise or fold. In the case that the first player who brought in only posts the bring-in, other players may have the option of completing the bet to $10 as the first raise. Once the betting is complete, every player left in the hand is dealt a fourth card, referred to as fourth street. In games that involve a button that dictates where the action starts, those differ from seven-card stud. In seven-card stud, the first player to act from fourth street on is the player displaying the highest-ranking hand. Seven-card stud is most often played as a limit game. Sticking with the same example of our $10/$20 seven-card stud game, the limits of betting on third and fourth street would be the smaller limit, or $10 in this case. On fifth, sixth and seventh street, the limits increase to $20. 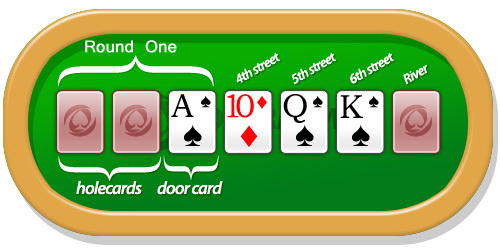 In the case that a player pairs his door card on fourth street, the opening player now has the option to bet double the small limit, or the larger limit. For example, if a player begins with an ace and picks up another ace on fourth street, that player may open with a bet of $20 instead of $10. This unique betting rule only takes place in the high version of seven-card stud, and not the split-pot version. In seven-card stud, it is very important to pay close attention to the cards of your opponents. If you, for example, have a straight draw with , but you already see three aces on the table, then you are only drawing to one ace and the remaining nines in the deck. If a player folded the case ace and you are unaware he or she did so, you could be incorrectly estimating your odds in the hand.